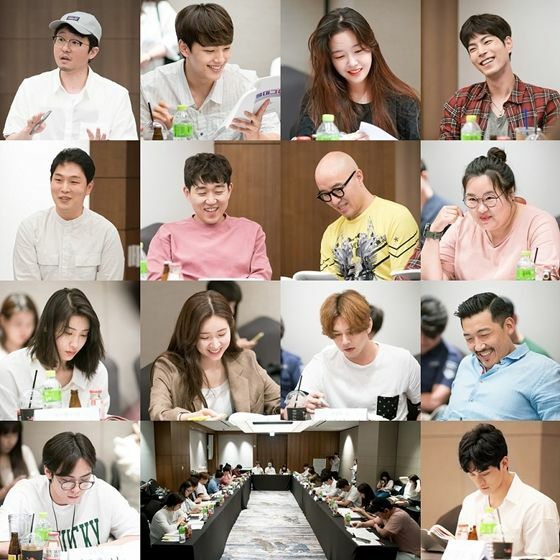 It’s a totally different main cast of three for the upcoming K-version of Absolute Boyfriend (Zettai Kareshi) but judging from the smiles and cheerful attitudes at the script reading the mood is certainly positive. 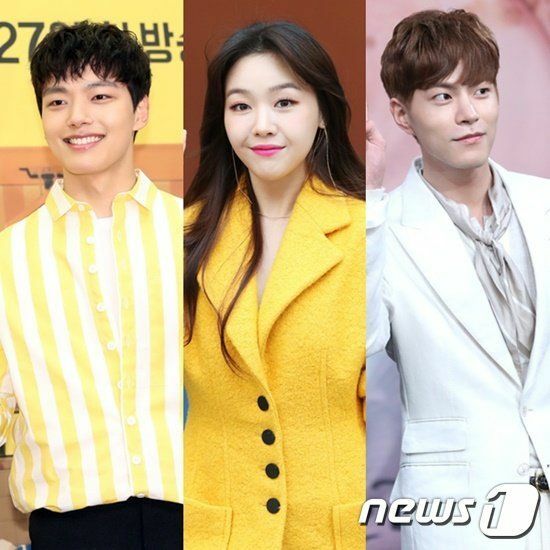 Yeo Jin Goo will play the titular perfect boyfriend who happens top be a love robot, Minah is the girl who gets said robot and learns about love, and Hong Jong Hyun rounds out the cast as the top actor star who ends up vying with a robot for the love of a human girl. I don’t know if robot dramas are the K-theme of the year (outside from stalwarts medical and legal dramas) because this is the second robot drama to arrive with the first being Are You Human Too with Seo Kang Joon, and even earlier this year was the artificial intelligence robot romance Love Like a Human which both Yoon Eun Hye and Yoon Hyun Min turned down. I really liked the jdrama of Zekkare, they did a good thing by aging up the characters. I’m glad the kdrama also has them being adults and I like all 3 main cast but I don’t know why they’re changing Soshi’s character to a ‘top star’, such a kdrama cliche, ugh. There was no robot in that drama so its false to call it that. AYHT has a proper robot for the lead just like this one. Moreover, AYHT was the first to be produced and not INAR. It just came out later due to pre-production. I get annoyed when people say AYHT copied some details or is actually similar to INAR lol. I’ve always thought Im Not a Robot was hurriedly put together to copy Are You Human Too. It does come across as a cheap copy of Are You Human which is superior in both acting and story. I guess the non existent ratings of INAR speak for itself. Love Yeo Jin Goo and Hong Jong Hyun to bits but wouldn’t know Minah from a bar of soap and another robot drama so yeah nah… pass. However if Seo Ye Ji was cast as female lead well that would be a different story. It would be a definite watch. And no my reasons are not because “I’m not into the whole idol as actors” buzz train – just really got no pull factor to want to see this. And HJH as second lead losing out to love once again! Can’t do it. Minah is alright.I saw clips of her in Beautiful Gong Shim starring Nam Goong Min.I think she would make it work with Jin Goo. As for Seo Ye Ji, NO!! !Just seeing her in “Lawless Lawyer” showed me she has a lot of depth and range in her acting and she has a mature aura too.So I feel it would be a waste of her talent to be starring in dramas with juvenile scripts like hwarang and moorim school.This one seems kind of juvenile too.Id rather she stars in more thrillers like “Save Me” or do a melodrama or just pure mature romance with another mature actor(like the actors in the 30s range.She is almost 30 herself) or simply much more meatier roles.Or maybe comedy with actors who are good at the genre like Park Seo Joon or Jo Jung Suk. @RubyRed – Yes you are so right and I’m clutching at straws plus it’s wishful thinking cos she’s gone off the radar. I’m in my post mortem phase after LL and now I have to wait patiently for any bit of news to surface on her next project and watch re runs of her past works. Such is life. I was watching The Bros on Netflix and lo n behold she popped up there! I totally forgot she was Lee Dong Hwi’s gf. That was a nice surprise. Hi koala, would you please watch legend of Yun xi and make articles about it? It’s Chinese drama but the OTP is very addicting to watch…. Please give a try…. I don’t know why they keep creating robot dramas. Im Not a Robot and Are You Human Too both bombed in ratings, even though I enjoyed both dramas. I’m just excited to see Hong Jonghyun again after his portrayal of Wang Rin. Thought he is due for a lead role. But him and Yeo Jingoo together on screen would be a treat. I’m just excited to seek him walk away with the girl again. I find YJG to be the misfit because I like Minaj with HJH a lot. lol this is not the first time they’re playing a couple, Minah made her acting debut opposite HJH in Vampire Idol (I think she only had cameos before that). It was silly and not really a romance but they were cute together. @Ned – rather rich of you to talk about ‘non existent ratings’ for INAR considering AYHT is barely breaking 1 percent over what INAR was getting and is also last in its time slot. There’s zero similarity between the themes or plots of the two dramas, even the degree of robot involvement in the plot is different so idk why some of you stans are so salty and insisting one copied the other. You must be sleeping if you didn’t notice AYHT hit over 9% ratings and pulling in huge buzz online which the other drama never did. To be fair, AYHT pulled in 9% only because its competitors weren’t airing. And about online buzz, I’ve noticed many crazed shippers of Yoo Seungho-Chae Soobin during the show’s airing so I guess they are pretty even. Still, I prefer AYHT because while the premise of human vs robot is nothing new, I can’t predict how the story will go or end. Seo Kangjoon’s acting as a robot, robot impersonating a human, and then a human is also kinda fascinating to me; and I love the balance between politics and romance. INAR was just too… fluffy for my taste. Crazed shippers doesn’t signify anything except for the fact that they are crazy delusional. There are crazy shippers for nam juhuyk & shin se kyung as well but botwg wasn’t even close to being popular either domestically or internationally. I think almost everyone prefers ayht because it has actual logic & deals with complex questions.